1. Son of Jehu; second king in the fifth dynasty of northern Israel; reigned 814-797 B.C. During the period of his rule Syria under Hazael and Ben-hadad became particularly aggressive (II Kings xiii. 1-9, 22); Israel's army was reduced to a mere handful of troops (ib. xiii. 7); and the land was practically at the mercy of the Syrians, as foretold by Elisha the prophet (ib. viii. 12). Israel's religious decline is likewise noted, in the continuation of the abominations of Asherah worship in Samaria (ib. xiii. 6). The humility of Jehoahaz and his appeal to Yhwh call forth the statement that a savior was given and Israel was released from its oppression. Just when that savior appeared or who he was is not determined. But in II Kings xiii. 25, xiv. 27, Jehoahaz's son Joash and his grandson Jeroboam II. would seem to fulfil the requirements. It is also true that Adad-nirari III., King of Assyria (812-783 B.C. ), made campaigns into the west (804-797), and on one of the incursions captured and sacked the city of Damascus, and thus removed the worst enemy of Israel's prosperity (Schrader, "K. A. T." 3d ed., p. 260).Bibliography: Commentaries on Kings; histories of Israel by Stade, Guthe, and Winckler (i. 154); Goodspeed, Hist. of Assyria and Babylonia; J. F. McCurdy, History, Prophecy, and the Monuments; Price, Monuments and Old Testament, §§ 140-142. 2. (Called also Shallum.) Third son of Josiah, King of Judah (II Kings xxiii. 31, 36). In I Chron. iii. 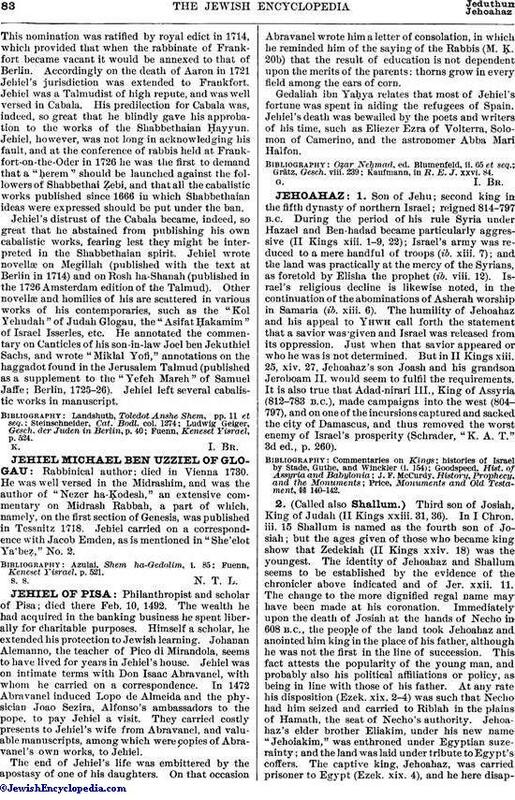 15 Shallum is named as the fourth son of Josiah; but the ages given of those who became king show that Zedekiah (II Kings xxiv. 18) was the youngest. The identity of Jehoahaz and Shallum seems to be established by the evidence of the chronicler above indicated and of Jer. xxii. 11. The change to the more dignified regal name may have been made at his coronation. Immediately upon the death of Josiah at the hands of Necho in 608 B.C., the people of the land took Jehoahaz and anointed him king in the place of his father, although he was not the first in the line of succession. This fact attests the popularity of the young man, and probably also his political affiliations or policy, as being in line with those of his father. At any rate his disposition (Ezek. xix. 2-4) was such that Necho had him seized and carried to Riblah in the plains of Hamath, the seat of Necho's authority. 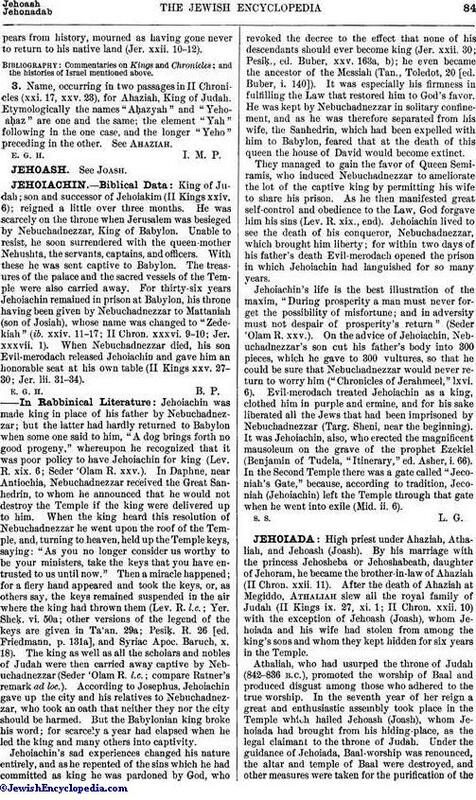 Jehoahaz's elder brother Eliakim, under his new name "Jehoiakim," was enthroned under Egyptian suzerainty; and the land was laid under tribute to Egypt's coffers. The captive king, Jehoahaz, was carried prisoner to Egypt (Ezek. xix. 4), and he here disappearsfrom history, mourned as having gone never to return to his native land (Jer. xxii. 10-12).Bibliography: Commentaries on Kings and Chronicles; and the histories of Israel mentioned above. 3. Name, occurring in two passages in II Chronicles (xxi. 17, xxv. 23), for Ahaziah, King of Judah. Etymologically the names "Aḥazyah" and "Yeho'aḥaz." are one and the same; the element "Yah" following in the one case, and the longer "Yeho" preceding in the other. See Ahaziah.E. G. H. I. M. P.